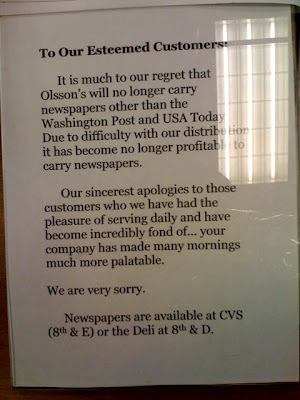 The end is nigh for the newspaper business. If that photo (unapologetically stolen from SAI) doesn't sum it up, then nothing will. Radio, look at this and see your potential future. If you insist on thinking you're in the broadcasting business and you think your FCC license and your transmitter are your greatest assets, then look to the newspaper industry to see your future in 3 years. Realize you're in the audio content business. If you understand that your greatest assets are people who excel at educating, informing and entertaining an audience with just their mind and their voice then you'll move forward. Sitting back and trying to wait out the changing world will work as well for you as it did for the newspaper guys. The business won't be the same. Broadcasting will be just one channel of distribution (an increasingly irrelevant channel). Your monetization models will change (more performance based ads and sponsorships). The industry might be smaller in terms of gross receipts but larger in terms of profits. The style of programming will change (it will be shorter and micro-chunked to facilitate P2P viral distribution). You'll have much less control over how your media is consumed but far better data about who is consuming it and why they listen. But if you think your stick and your signal are your primary competitive advantages then you're doomed. Edit: Just a quick follow up. Tribune is cutting 80 newsroom jobs.